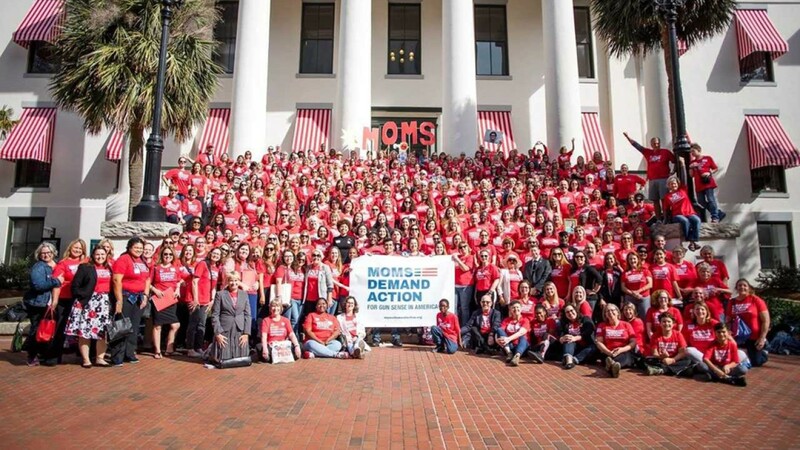 TALLAHASSEE, Fla. — It was an army of red on Wednesday as hundreds of mothers demanded change in Tallahassee. "To have a kindergartner tell you this is where they go to hide from a bad man, it's heartbreaking," said Kelley Diveto, a member of Moms Demand Action, a group working to prevent gun violence. "You never know when or where the emotions are going to hit," Luke Sherlock said. Sherlock wears a red shirt with a survivor button for his niece, Gina Montalto. Last year, she was one of 17 people killed in a mass shooting at Marjory Stoneman Douglas High School in Parkland. "Almost every single day, at some point, something affects you," Sherlock said. Though Sherlock and Diveto have different stories, they have the same goal. "To try to prevent this from continuing to happen," Sherlock said. "All volunteers, we are moms, dads, grandparents, aunts, and uncles," said Diveto. "You don't have to be a mom in our group." With 500 people by their side on Wednesday and dressed in red, they went to Tallahassee demanding to be heard. "I mean, we had the red army walking up to the Capitol and we took over that Capitol building," Sherlock said. "You couldn't go anywhere in the Capitol yesterday without seeing a group of people in red shirts." The group was there asking lawmakers to require universal background checks for all gun sales in Florida. Along the way, they hoped to start a conversation on both sides. "Not everything will happen in one bill to solve gun violence, but that we are making positive steps and positive changes in Florida," Diveto said. The forum will benefit the Gina Montalto Memorial Foundation, and donations will be collected at the door. For more information, call 954-725-7200.